NOTE: you will need a TV mounting bracket, and a TV. I used one that I purchased in a local Microcenter. However, most of you will not have a Microcenter nearby, and Best Buy prices are very high, so the best option is to buy a wall mount on Amazon. The wall mount I chose can swivel, so it can be watched more comfortably from the couch. Also, most RVs have a 27″ TV in the front, which should fit a 32″ flat screen perfectly (except for gaps on top and bottom). CHOOSING A TV: I decided to go with Samsung 32″ Smart TV (1080p) because I wanted to have USB input, to play cartoons for my kids off of a USB thumb drive, as well as have built-in functionality for Netflix, YouTube and other streaming services, without needing a Chromecast. TV WEIGHT: Samsung was also one of the lightest 32″ models, coming in at mere 8.6 lbs. This is important, considering that TV housing is built from 1/2″ plywood, so you want a TV that’s as light as possible! I went with Samsung because the less expensive brands (VIZIO), have been known to spy on their users, with mics and built-in cameras. Do you really want some “dude” to see what you are doing in your RV all the time??? REFER TO THE VIDEO ABOVE, IF YOU ARE CONFUSED ABOUT THESE STEPS. 1. Toss your old TV, to expose the “box” that houses it. 2. Measure the opening, to make sure your new TV will fit. In my case, I had an old Panasonic TV, and a new Samsung fits perfectly on side margins, giving me about 1/2″ total side clearance. 3. Decide if you want a FIXED or SWIVEL mount. I chose swivel, so I can pull it out and move the TV to the right about 20″, making viewing it from the couch much more comfortable. 4. 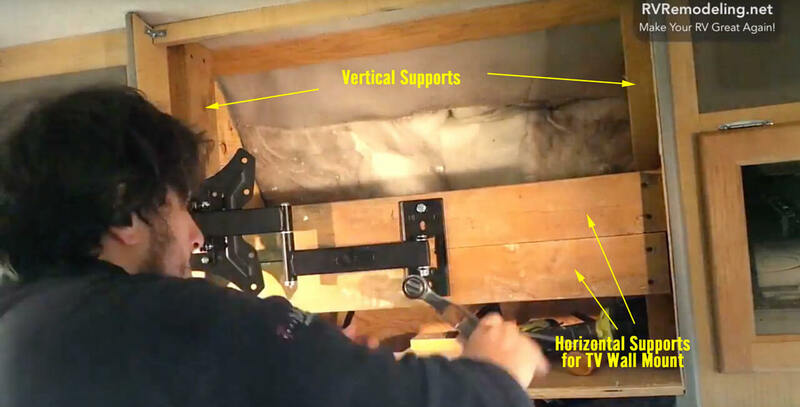 Measure the total depth of your TV + wall mount, to figure out where to place your framing that will hold the TV in place. Also consider that if you use a SWIVEL mount, you will need some sort of brackets that will hold the TV in place, when you drive. Once you figure out the depth, you can begin installing. 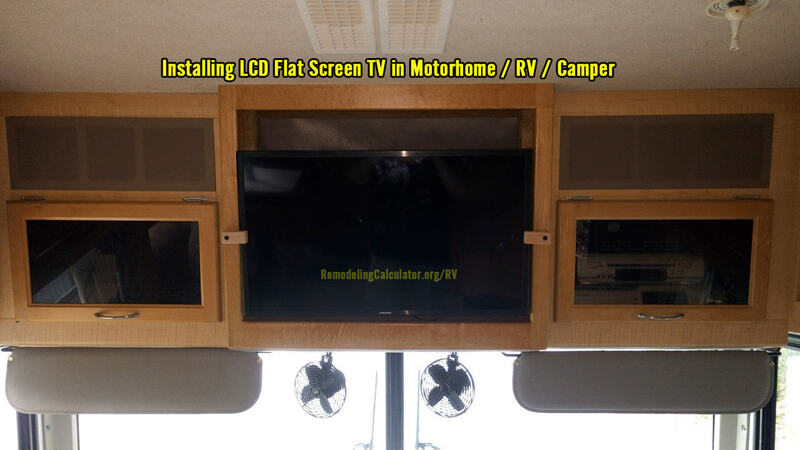 All motorhomes/campers are different, but most will have a “TV BOX” in front, and will be old 27″ CRT giants. This box or enclosure, should be built out of 1/2″ plywood. This means that you can attach 2×4 framing inside the box, and make sure it’s fairly sturdy. What I recommend, is measuring and cutting 2 vertical posts, and 2 horizontal posts from your 2×4 wood. Vertical posts will provide mounting support for horizontal cross beams. Horizontal posts will hold wall mount in place. 2) Add 1.625″ to the “depth”, and mark it inside the box on top and bottom of each side wall. 3) Measure the height of your TV box, and cut 2 pieces of 2×4 to the height length. These will be your vertical mounts. 4) Install vertical mounts with 2.5-3″ wood screws. Use at least 4 screws per mount. 5) Measure how high you want to position your TV, and attach horizontal mounts accordingly. Use at least two 3″ screws at each end, of each horizontal beam (8 screws minimum). Pre-drill horizontal beams to make sure the screws do not make splits in the wood. 6) Measure the center of horizontal beams, and mark locations for attaching wall mount. If your wall mount has 3 bolts to hold it in place, put the end with 2 bolts on the top. 7) Pre-drill holes for Wall Mount bolts with 1/4″ drill bit. Install wall mount. 8) Attach TV to the wall mount. I also used 2 “L” brackets to attach top horizontal beam to vertical beams, to be 200% sure, it won’t fall of. This is an overkill, but at a cost of $1 per L bracket, it a cheap safety pre-caution. I added 2 side brackets to the outside of the TV, to keep it in place while driving. I used 1/2 x 1 inch wood to make the bracket and spacer (to extend the bracket out), and 1/4″ heavy-duty screws to attach brackets. Moreover, since all modern TVs are “wide-screen” and have 16:9 ratio, and old TVs had 4:3 ratio, as well as massive top and bottom margins, you will have big gaps on top and bottom. However, a 32″ TV should stretch pretty well from left to right, leaving a minimal gap. What you can do is install 2 pieces of board on top/bottom, behind TV box outer edge frame, to hide these gaps. I never had time to do this, as it’s not such a big deal for me. If you plan to do this, you can use 1/2″ plywood, or board. I also recommend a couple of coats of clear polyurethane on the outside surface of each board. If your wood trim is not clear, match poly with transparent wood varnish that has color. Here is the final product so to say. Note in this video I do not have the holding brackets in place … only a photo of them, made afterwards. 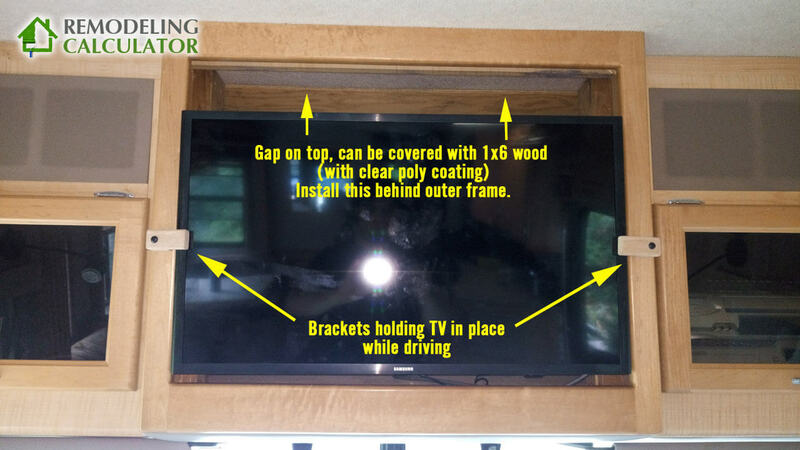 All in all, installing a Flat Screen TV in your RV / Motorhome / Camper is fairly easy, and only takes a couple of hours. You should have all the parts ready. In my case, the wall mount from Microcenter did not have long enough bolts to attach TV, so I had to go to Home Depot to get 8mm bolts, with 1.25 thread, and 25mm length (standard bolts for TV mounts??) to attach TV to the wall mount. Bolts that came with mount were only 15mm long. 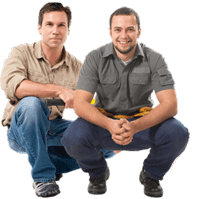 Check out our other RV/Motorhome DIY guides.